Angina is chest pain caused lack of oxygenated blood to the heart. If the coronary arteries are narrowed, the reduced blood flow means that the heart receives less oxygen than it needs to function at a normal rate. 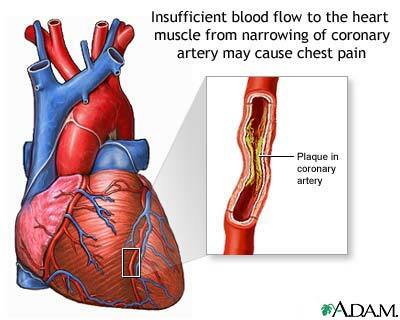 A common cause of narrowed coronary arteries is atherosclerosis (a condition characterised by fatty plaques) which develops in the wall of arteries. Angina is often a warning sign for a possible heart attack. If a coronary artery becomes blocked, either by fatty material or a blood clot then part of the heart muscle is starved of oxygen. Increased age, weight and smokers have a higher risk of suffering from angina. Angina is normally triggered by exertion although some other recognised triggers are intense emotion, like fear or excitement, colder temperatures and eating larger meals. Although Angina can cause heart attacks it is manageable A change lifestyle choices can help and prevent the coranry arteries from narrowing further are; to maintain a healthy weight, eating low fat and cholesterol foods, taking medicines to treat angina, high blood pressure and cholesterol as well as not smoking. Endocarditis is an infection of the endocardium (the membrane that lines the inner surfaces of the heart) also known as the heart valves. Endocarditis may occur in people who have certain pre-existing heart diseases. Some dental and surgical procedures increase the risk of endocarditis because some bacteria's may be introduced into the bloodstream. Without any medical treatment, the infection could harm or destroy the endocardium. Symptoms of Endocarditis are; fever, chills, lethargy, loss of appetite, pain in the body, abnormal heart rhythms or murmurs, increased breathing rates and a persistent cough. 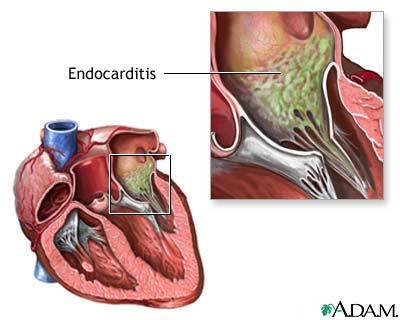 Although endocarditis is a bad condition to suffer from it can be treated by; a course of antibiotics, surgery and use of blood thinning medication.